Hajar, A. (2015). ‘Significant others’ in influencing Arab EFL learners’ learning strategy use and development: A qualitative study. Studies in Self-Access Learning Journal, 6(3), 257-270. The paper reports on the involvement of ‘significant others’ (e.g. parents and friends) as experienced by a group of learners learning English at university in their Arab homelands. Underpinned by a sociocultural standpoint, the data collected from a written narrative and four subsequent semi-structured interviews suggest that ‘significant others’ directly and indirectly fostered or hindered the participants’ English language development and identity formation by prompting different strategies. Further research into the cooperation between actors inside and outside the classroom is believed to generate essential findings for the language learner development programmes. The ‘social turn’ in language learning research (Benson & Cooker, 2013), with new theoretical and analytical tools, has come under the sway of a sea of change in research and theory towards exploring ‘the socially, culturally, and historically situated nature of language learning’ (Morita, 2012, p. 26). Some researchers endorsing socially oriented theoretical perspectives (e.g. Gao, 2006; Mercer, 2011; Norton, 2013) have challenged the assumption that “foreign language learners’ development as language learners is largely language teachers’ responsibility” (Gao, 2006, p. 287). These researchers are also critical of the cognitive psychology perspective of language learning, which is largely based on the theory of human information processing to transform declarative knowledge into automatic knowledge. From this perspective, language learning strategies (LLSs) are often defined as learners’ efforts to enhance their own language learning and/or use (Cohen, 2011). In another vein, the purpose of deploying LLSs by some language learners is often limited to linguistic objectives, for example having good examination results. Learners’ strategy use from a cognitive psychological standpoint also tends to be exclusively associated with the learners’ exercises of their cognitive and metacognitive activities in addition to some of their personality traits such as extroversion and language aptitude (Norton & Toohey, 2001). According to Palfreyman (2003), the ‘social turn’ in education “offers a new dimension to the study of learning strategies” (p. 245), through depicting learners’ strategy use as something emerging from the mediational processes of particular learning communities. These processes might include artefacts, practices, and relationships among people. In this sense, the LLSs used by language learners are often influenced by the availability and accessibility of material and cultural artefacts, such as borrowing some valuable references from the school’s library or watching English TV programmes. Echoing this point, Palfreyman (2011) postulates that language learners’ learning motivations and strategy uses can “develop in multiple contexts; the classroom may be one of these, but a fuller picture of learning contains other contexts: the household, the peer group, the work place or neighbourhood shops” (p. 33). 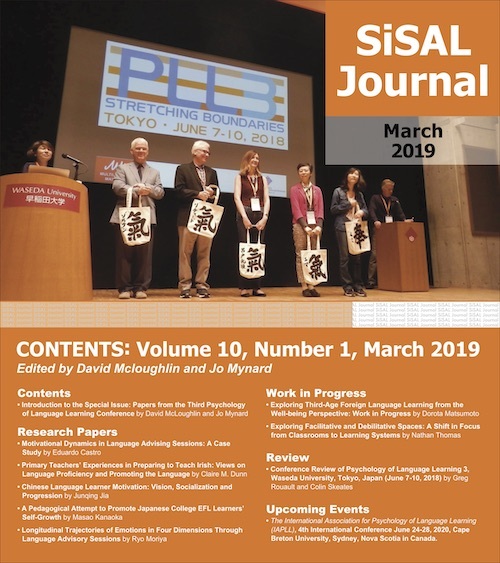 Lai (in press) argues that there has recently been a burgeoning number of research studies that investigate “the less charted terrain of language learning beyond the classroom” (p. 2). According to her, most of these studies (e.g. Chik, 2014; Murray, 2008; Wang, 2012) found that ‘good language learners’ were more likely to make use of a broad array of language learning resources available to them beyond the classroom (e.g., music, TV shows, the Internet and online chatting/forums), and that this was positively associated with their learning outcomes, confidence and enjoyment. Wang’s (2012) study, for example, explained how a group of Chinese students of English had overcome their difficulty of having poor listening and speaking skills by adopting the strategy of immersing themselves regularly and rigorously in English television drama at home in China. Based on the findings of her study, Wang (2012) suggested that the significance of watching movies rich in authentic and functional use of the target language was not limited to the advantage of pinpointing some specific linguistic facets that these students might still have needed to improve, such as pronunciation and intonation. This extended to being a mediating and enabling artefact for “an in-depth understanding of western social values, which will empower them [language learners] to become world citizens” (Wang, 2012, p. 339). By the same token, Murray (2008) recorded the language learning experiences of a few successful adult Japanese EFL learners, and found that they achieved intermediate to advanced levels of fluency through their engagement outside the classroom with technological tools related to American pop culture such as movies, TV programmes and music. Nonetheless, most of these studies paid a less central position to the potential of social agents in mediating the language learning resources to language learners. With the above in mind, this study is unique in that it is the first qualitative research study that has targeted the impacts of ‘significant others’ on a group of postgraduate Arab participants’ LLS use and development in out-of-school contexts. ‘Significant others’ stands for a group of individuals, such as family members, peers and neighbours who are often as crucial to a language learner as their teachers are (Palfreyman, 2011). To what extent do ‘significant others’ mediate the particular patterns of LLSs often utilised by a group of university learners from an Arabic background in their homelands? In this study, there were three males and three females. They came from four different Arab backgrounds (The United Emirates, Iraq, Saudi Arabia and Syria), and were non-English major students. Their age range was between 23 and 27 years. Moreover, all of them were unknown to the researcher before the data collection stage, and were preparing to join their postgraduate programmes in an English-medium university in the UK. The participants were given pseudonyms and their profiles are provided in Table 1. The data were collected between 5 May and 10 September 2013. The participants, after being informed of their role in the research and their right to withdraw at any time, were asked first to write a short account in Arabic about themselves and some of their English learning experiences along with the LLSs that they often employed. They were given a set of questions to help them frame their essays, as shown in Appendix A. These accounts were used to construct the interview questions, given that this study espoused a second-order stance i.e. seeing the world from the participant’s standpoint. Four subsequent semi-structured interviews with open questions in Arabic were conducted with each participant. Each interview lasted for 35-45 minutes (see Appendix B for a sample interview schedule). Given that all the interviewees were Arabs, I decided that Arabic was the best language in which to conduct my interviews. Using this shared language helped the participants express themselves freely. Despite the usefulness of adopting a qualitative approach in this study, the combined use of semi-structured interviews and an open-ended questionnaire that fits local research contexts is essential to explore language learners’ metacognitive beliefs about LLSs, along with capturing the mediating artefacts in either enabling or disabling the learners’ LLS use and identity development. A ‘selected reading approach’ (Van Manen, 1997) was used in this paper, meaning that as I was reading the transcripts, I highlighted the statements that captured the influences of ‘significant others’ on the participants’ language learning efforts and their strategy use and development. After that, the codes that shared some unifying features were collated to generate themes. Three main themes were identified according to the significant others’ kinds of mediation: 1) ‘a positive, indirect kind of involvement’ referring to sharing confident and delicate information with the participants without taking a procedural action; 2) ‘a positive, direct kind of involvement’ suggesting that certain significant others exposed the participants intentionally to language resources, and/or practised English with them, and 3) ‘a neutral to negative kind of involvement’ indicating that a range of discouraging behaviours such as openly belittling the value of English learning or disregarding the participants’ language views were transmitted by some social agents to the participants. Following this, the transcripts were re-read with special focus on the coded extracts to ensure that the produced themes actually accounted for the data. Although my parents weren’t highly educated, I received from them unlimited financial support…my father gave me the money needed to hire a private Australian tutor to train me on IELTS test. I also subscribed in some websites to try out online some IELTS sample tests (Transcript Mouza, No. 2, 33-146). …the secondary school holiday was long. One of my friends told me about the importance of enrolling in an English private tutoring course to improve our English before joining the university. So, I informed my parents about this. I registered in one of the courses run by the British Council centre…In that course, I learnt how to discuss a specific point within a group and to explain how I completed a specific task in front of the class…I also learnt new vocabulary (Transcript Khaled, No. 2, 41-64). My peers and I were quite poor in English. I didn’t ask them for help as I know we were all suffering…This was the situation of most Syrian students in the rural areas… In out-of-the-school settings, we just check the homework given by our teachers (Transcript Rama, No. 1, 77-79). When one was sent to a remarkable international school and some of one’s teachers were English native speakers, the English level of that person would be definitely developed. This picture described my situation perfectly…the tuition fees of this school were extremely high. So, my parents gave me a spark to learn English (Transcript Fadi, No. 1, 34-44). My school was the first private school in Iraq that taught most of its classes in English. At that time, my mother insisted that English was not very important but that none could predict what would happen after several years. She was right especially after the fall of the regime of Saddam Hussein (Transcript Zainab, No. 2, 55-60). In this regard, the parents of Fadi and Zainab seemed to buy into ‘the idea of the earlier the better’, principally when it pertained to their children’s English language learning. I was addicted to English language movies and my father knew that. Therefore, his gifts to my sister and me whenever we passed the exam at school were choosing ten animated movies. Most of these movies were in English (Transcript Zainab, No. 3, 66-68). My uncle’s children increased my love for English. They lived in the UK for many years. They told me a lot about the lifestyle of the British. I learnt from them many new words and idioms…I hung a large map of Britain on the wall of my room to get to know more about its geography (Transcript Fadi, No. 4, 81-94). Accordingly, some of Fadi’s extended family members played a pivotal role in deepening his interest in learning English. They were also one of the main causes that encouraged him and his parents to choose the UK to complete his postgraduate studies. During the summer period, I used to read some of my brother’s poetry books in his personal library. Poetry not only helped me to learn new words but also to know more about English culture…he also motivated me to read and write some poems. My family were very proud of me (Transcript Zainab, No. 4, 23-34). I started listening to English songs with my sister after attending university. I loved Celine Dion’s songs. With her songs lyrics found in some websites, I sometimes put new words and phrases in my notebook to lodge them in my memory. I also revise them with my sisters (Transcript Nasser, No. 3, 94-97). I was sent to under-resourced rural schools and none of my family could speak any English…my parents were farmers…we didn’t have a satellite TV or a computer in our house…I couldn’t even dare to ask any of my family to finance private English tuition classes for me at university because of our bad financial situation (Transcript Rama, No. 2, 105-128). This extract suggests that Rama ascribed this limited family involvement in her English learning to the low income and education level of her parents. I used to teach myself how to play guitar from free English video lessons on YouTube…I also used to upload some videos of my playing to get feedback from others. However, I gave up my guitar at university because this slowed down my achievement (Transcript Khaled, No.4, 66-69). In effect, Khaled’s decision to stop playing guitar in order not to passively affect his academic progress might refer to the importance of integrating students’ outside-the-classroom activities into the classroom. The findings illustrate how ‘significant others’, mainly parents, influenced the participants’ strategic language learning behaviour, including their own language beliefs and motivations, simply because these participants were not born with their existing set of values and beliefs attached to learning English. As shown in the previous section, the socio-economic status of the participants’ parents related to their occupation, income and educational attainment seemed to play a pervasive role in identifying the amount and kind of support they offered their children while learning English (Zaragoza, 2014). Although the participants, excluding Rama, belonged to better-off families, the influence of the parents of participants who were educated in the public sector on their English learning was, in Kyriacou and Zhu’s (2008) words, “largely benign” (p. 101), and appeared at a late stage of their academic lives i.e., after entering university and realising the role that English could play in their children’s future. On the other hand, it has been shown that the parents of two participants who were educated in tuition-charging private formal settings (Fadi and Zainab) were highly educated and financially stable, and they both directly and indirectly involved in their children’s language learning and development. Their parents enabled them to enact their future self-image confidently as English speakers before going to university, by adopting a variety of strategies such as by sending them intentionally to outstanding private schools from the beginning of their lives, practising English with them inside the house and offering them some technology-mediated language resources. This finding seemed to be inconsistent with the claim suggested by many language researchers (e.g. Block, 2007; Ryan & Dörnyei, 2013) that pre-university students engaging in the process of foreign language learning are likely to be unable to recognise the primacy of learning the target language in their lives, or even to identify realistic language learning goals. Block (2007), for example, argues that “there is usually far too much first language-mediated baggage and interference for profound changes to occur in the individual’s conceptual system and his/her sense of self” (p. 144). However, this study showed that language learners in English as Foreign Language contexts might be able to do so if their awareness of English had been properly nurtured inside and outside the classroom. As Gao (2012) argues, parents “can be regarded as highly proactive ‘shadow’ teachers for their children, whose support was essential to their success in learning English” and in conceptualising future visions that hold the flavour of actuality rather than fantasy (p. 592). It should be noted that the reference made by some participants to the direct effects of their brothers or sisters on their language learning and strategy use could point to an increasing mindfulness of the new generation in the Arabic-speaking world as regards the significance of English in one’s life. In this sense, Gitsaki (2011) in the preface to her volume on teaching and learning in the Arab world has emphasised the rapidly rising interest in English by Arabs in the twenty-first century: “Education is undergoing significant change globally and locally. In the Arab States, globalization and economic development have had a significant effect on [English language] education” (p. xiii). In sum, social networks in language learning beyond the classroom are a fairly new area for research, which would benefit from further investigation. In this study, for instance, the impact of family members, mostly parents, on the participants’ strategy use and learning motivations was crucial, and varied according to the family’s socio-economic status. 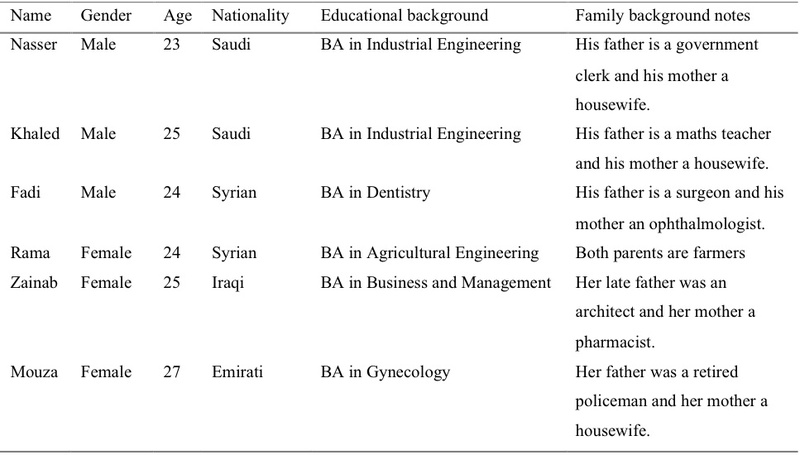 This influence of family members on Arab students in their homelands might not be mirrored in some other modern societies, where a learner’s peer group appears to be as or more powerful than the family. Therefore, research on individuals from other places or countries with different sociocultural, economic and political conditions, in relation to the impacts of informal agents (e.g. family members, neighbours, and friends) on their strategy use and identity development would enrich the data base available. Anas Hajar is a graduate of Warwick University holding PhD in English Language Education. He is currently working as an EAP tutor at Coventry University, UK. He is particularly interested in motivational issues in language learning and intercultural engagement. He also works in the areas of language learning strategies and materials design. Benson, P., & Cooker, L. (Eds.). (2013). The applied linguistic individual: Sociocultural approaches to autonomy, agency and identity. London, UK: Equinox. Cohen, A. (2011). Strategies in learning and using a second language (2nd ed.). London, UK: Longman. Damerow, R., & Bailey, K. (2014). Research on the teaching and learning of English in the Arabic-speaking world. In K. Bailey & R. Damerow (Eds. ), Teaching and learning English in the Arabic-speaking world (pp. 1-13). Abingdon, UK: Routledge. El-Ezabi, Y. (2014). Foreword. In K. Bailey & R. Damerow (Eds. ), Teaching and learning English in the Arabic-speaking world (pp. viii-xi). Abingdon, UK: Routledge. Gitsaki, C. (Ed.). (2011). Teaching and learning in the Arab world. Oxford, UK: Peter Lang. Mercer, S. (2011). Towards an understanding of language learner self-concept. Dordrecht, Netherlands: Springer. Morita, N. (2012). The situated construction of identity and positionality in multilingual classrooms. In M. Sarah, S. Ryan, & M. Williams (Eds. ), Psychology for language learning: Insights from research, theory and practice (pp. 26-42). London, UK: Palgrave Macmillan. Palfreyman, D. (2011). Family, friends, and learning beyond the classroom: Social networks and social capital in language learning. In P. Benson & H. Reinders (Eds. ), Beyond the language classroom. The theory and practice of informal language learning and teaching (pp. 17-35). Basingstoke, UK: Palgrave Macmillan. Ryan, S., & Dörnyei, Z. (2013). The long-term evolution of language motivation and the L2 self. In A. Berndt (Ed. ), Fremdsprachen in der Perspektive lebenslangen Lernens (pp. 89-100). Frankfurt, Germany: Peter Lang. Van Manen, M. (1997). Researching lived experience: Human science for an action sensitive pedagogy (2nd ed.). London, UK: Althouse Press. Zaragoza, E. (2014). Social class and autonomy: Four cases studies in a Mexican SAC. In S. Mercer & M. Williams (Eds. ), Multiple perspectives on the self in SLA (pp. 192- 210). Bristol, UK: Multilingual Matters. What is your perspective about learning English at that time? What sort of problems did your usually have in learning English? How did you sort them out? Why do you think that you are learning English? What kind of linguistic challenges did you face in your homeland? How did you deal with the difficulties? Did you have enough opportunities to practise English outside the classroom? If no, why? Is there any outstanding event/person that encouraged or discouraged you to learn English? When did you actually recognise the importance of English in your life? Have you found sufficient chances to communicate with native/competent speakers of English in your homeland? If yes, how? If no, why? What about the role of your peers in facilitating your English learning? Where did you used to encounter or learn new words in your native country? And what did you do in order to consolidate your memory of new words? What about the role of technology in your life? Do you use it to improve your English? If yes, how? If no, why?